Even in a place like the Marvel universe communication is key in resolving conflicts and team performance. Get Tony Stark, Steve Rogers and the other Avengers in a conference call and who knows, the whole Civil War thing might have been avoided. With conference events, we can build a dashboard how Iron Man would have probably built it for the Avengers to monitor their conference calls. Alright we should be properly prepared to start coding. Ready? Let’s go! This will install all necessary dependencies for us and provide us with a basic server to work on. Copy the .env.example in the main directory to a new file called .env and add the credentials of your Twilio account from the Console. Now we are ready to run the server. For this, we can either type node index.js from the main directory of the project or use the npm run dev script. The latter uses nodemon to make sure that the server is reloaded every time we do a code change. Now that we have our application running we need to connect a Twilio phone number to it so we can dial into the conference. For this we first need to expose our application to the internet via a public URL. This is where ngrok comes into play. 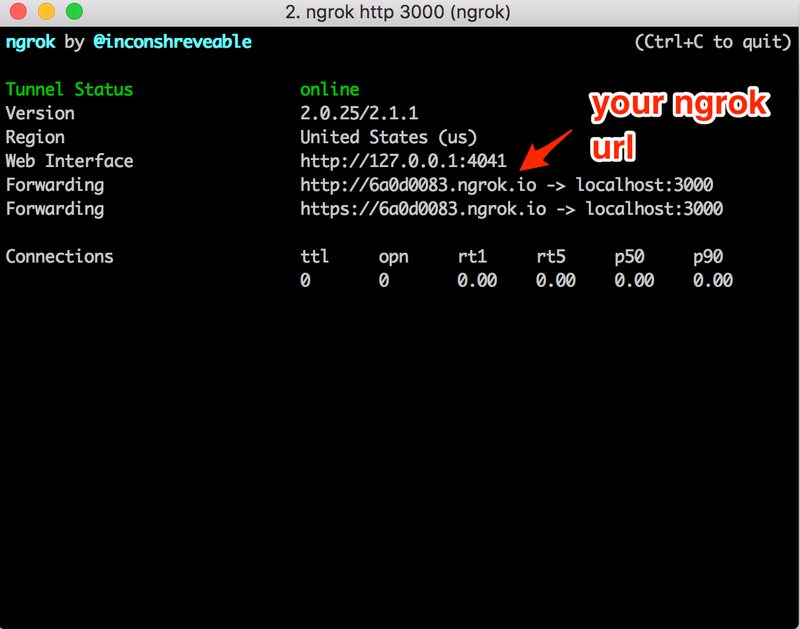 Run ngrok http 3000 in a separate terminal and keep it running. You will get an ngrok URL that we will use with our Twilio phone number. This TwiML instructs Twilio to first respond to every call with a voice saying “Welcome to the conference!” using the <Say> verb. Afterwards, it uses the <Dial> to direct the call into a <Conference>. 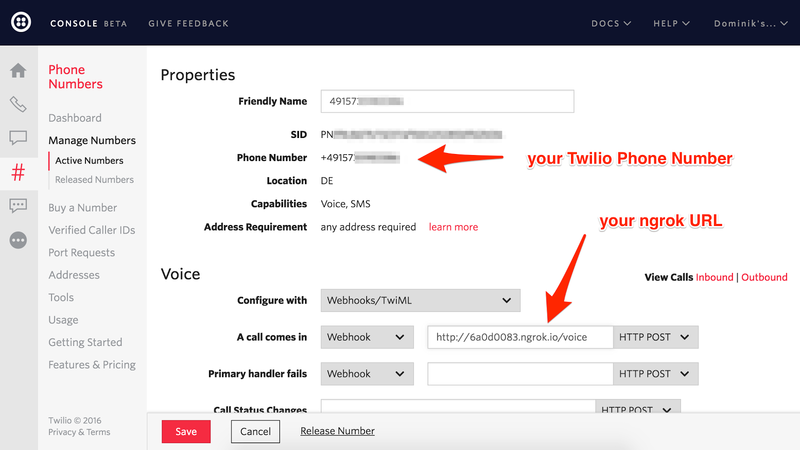 The waitUrl attribute specifies which webhook Twilio should contact for instructions what to do while the call is waiting for the conference to start. In our case, we use a Twimlet that plays a song for us. Call the phone number and you should be able to hear “Welcome to the conference” followed by some music. That’s awesome, however, we are not done yet. We want to receive updates whenever the status of the conference changes. For this we need to add two new attributes statusCallback and statusCallbackEvent to the <Conference> element. We’re telling Twilio that when the start, end, join, leave and mute conference events happen, we want it to make an HTTP request to the /status route of our application. Reload http://.ngrok.io/voice and you should be able to see the updated XML. That’s it! Give your number another ring and you should be able to see events being logged in the console. Make sure to wait until the music starts before you hang up in order to properly join the conference. 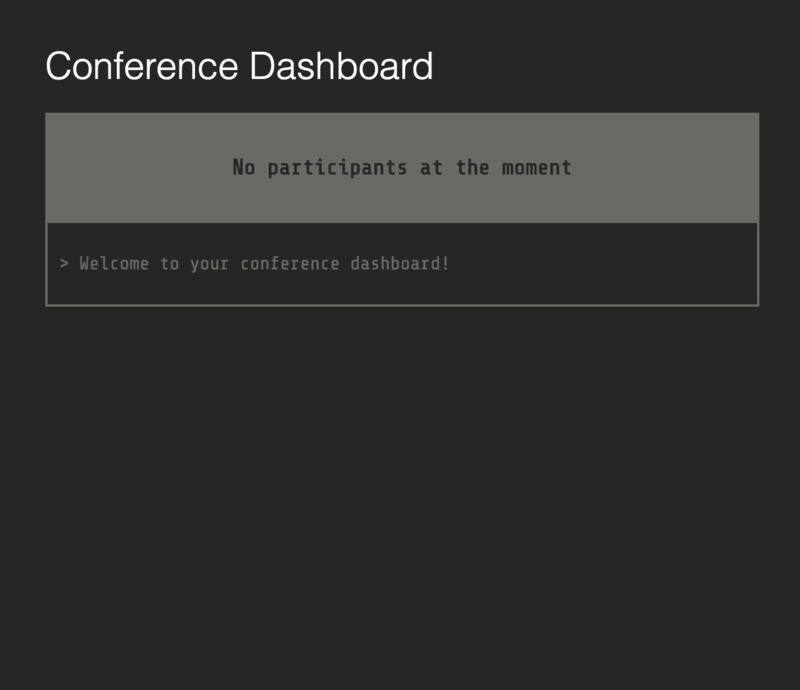 The events you should see pop up in the console are participant-join, participant-leave and conference-end. There is no conference-start event since the conference will only start once at least two participants are in. 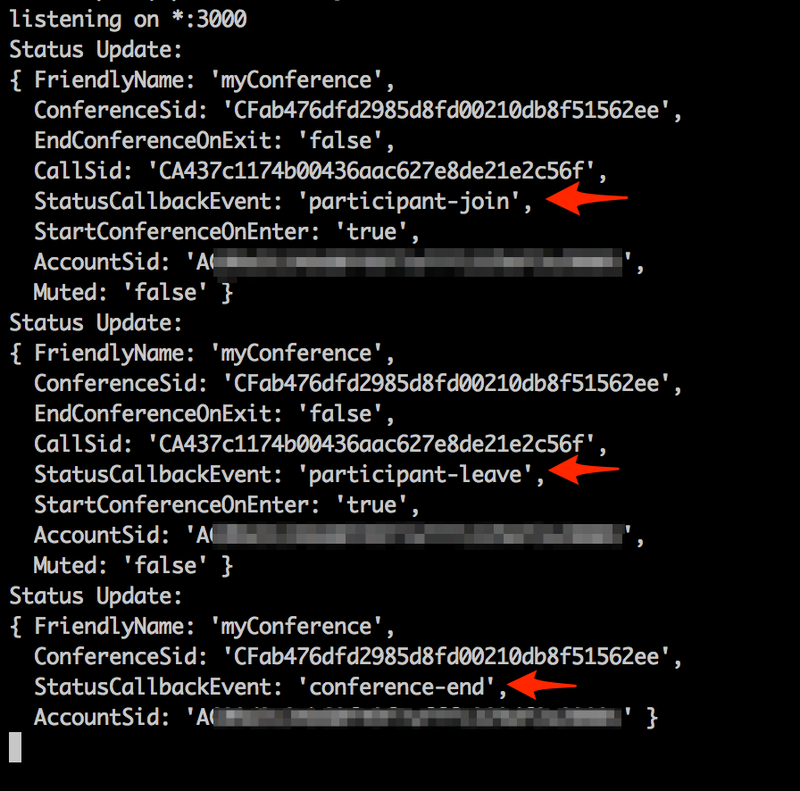 If we have a close look at the data we receive in the statusCallback request, we get data about the conference like the callback event, conference friendly name, and the conference SID. We’ll store those in a variable named data and for use in our dashboard. One thing we don’t get is much about the actual caller, like their phone number. To get that we can use the Twilio Node.js helper library and the CallSid to look up the Call resource. Dial the number again and you now have the phone number of the caller which you can use to locate even more information from a source like a local database. Say for example we wanted to find out which superhero was calling into the conference. You could use the handy database of superhero phone numbers that you keep, or you could just use the one I’ve included in the project. Now that we have all the caller data collected we need to send it to our dashboard whenever there is a new conference event. To do this we will use a WebSocket wrapper called Socket.IO. Require the Socket.IO module in our index.js and pass it an HTTP server instance. We are returned an io instance that allows us to send messages and listen for events. Because we want to send those messages to the dashboard when Twilio requests the /status route, we’ll pass the instance of Socket.IO into that route handler. The last thing we need to do is to listen for the respective events in our dashboard. For this, we need to open the conference.service.js file in the public folder. I already made sure to include the Socket.IO client library in the index.html and added it to Angular’s dependency injection. So we are ready to use it and populate the initialize function of the service. For each of the events, we create a new eventData object that contains the event name, the data it sent as well as a readable message that we generate with getEventMessage(event, data). Additionally, we maintain an object containing all participants. This object has to be updated depending on the message. Once we have all necessary data we broadcast it in order to inform components such as our controller that there has been an update. For this we use the $rootScope.$broadcast function of AngularJS. That’s it. The connection is established and the data is being piped through. If you navigate to in your browser to http://localhost:3000/ and start calling into the conference with a couple of phones you should be able to see your dashboard being populated with the team and the respective log messages! Comms and dashboard up and running. Time to save the world! We did it! We have not only a way to easily get everyone in the same conference call but a way to monitor status changes in the conference. Building a dashboard using these events is just the beginning and I’m curious to hear what you build with it! Talk to me on Twitter @dkundel, via email at SIGNAL. If you didn’t register yet for SIGNAL, there is still time! Iron Man didn’t RSVP yet but there will be certainly enough bots and you shouldn’t miss $bash. Use DKUNDEL20 to get a 20% discount when registering. I’m looking forward to seeing you there!